Scientists have detected new effects of climate change in Cuba’s already strained agricultural sector. HAVANA, Sep 26 2013 (IPS) - A rise in temperature modifies the physiological features of some plants – a consequence of climate change that is less perceptible than stronger and more frequent hurricanes, but just as harmful to food production. In tropical species in the Cucurbitaceae family, “like squash or cucumber,” pollination is interrupted if it is hotter than normal during flowering season, Cuban agronomist Sergio Rodríguez explained to Tierramérica. When the female squash flower is ready to be pollinated, the pollen from the male flower, carried by bees, is transferred to the stigma in the centre of the female flower. But if it’s too hot, the sticky sweet substance on the stigma dries up, the pollen can’t stick, and the fruit will not develop. In the last few years, summers have gotten longer and winters shorter and milder in this Caribbean island nation, scientists report. Temperatures are rising, which requires adaptation strategies for agriculture. Studies indicate that average temperatures could increase by 1.6 to 2.5 degrees by the end of the century in Cuba. And one of the most serious effects would be a drop in agricultural yields. Rafael González, a campesino or small farmer in the municipality of Manicaragua in the central Cuban province of Villa Clara, told Tierrámerica that “growing a little of everything” is the best way to weather higher temperatures, changing rainfall patterns and more intense tropical storms. “If there’s drought, we have ‘viandas’ (tubers and starchy fruits) that adapt better to those conditions, and we have other kinds of fruit that are more resistant to storms. Nothing is better than variety,” said González, who belongs to the Ignacio Pérez Rivas Credit and Services Cooperative, which has 130 members, including 30 women. The institution that Rodríguez heads, which is also located in Villa Clara, has the task of carrying out the search for crops more adaptable to intense heat, severe drought, hurricanes and new pests and diseases. INIVIT has a germplasm bank with seeds, cuttings, roots and bulbs from 650 varieties of sweet potato, 512 kinds of cassava, 327 kinds of banana and plantain, 120 kinds of yam, and 152 kinds of malanga, or taro root. These resources are “a strength that will help the country confront adversity,” Rodríguez said. Cassava and the plantain known as the “plátano burro” are resistant to drought, while taro root, sweet potato, squash and yams continue to produce food even after a hurricane hits, because they lie close to the ground and are better able to withstand heavy winds, he pointed out. “But we have to keep looking for new clones that are more adaptable to a broader spectrum of conditions, and varieties that produce in optimal as well as unfavourable climate conditions. In this last case, the yields might be lower, but the adaptability eases the impact,” he said. To do this, different varieties of crops must be studied in different climate conditions, to gauge their capacity to adapt to specific conditions, soil types, rainfall patterns and minimum and maximum temperatures, he explained. Seeds are key. “If you have a quality seed, the impact of climate change is less significant. We always tell the farmers that a good seed doesn’t wear out. It’s an investment that is later recovered,” Rodríguez said. Over 70 percent of tubers, roots, plantains and bananas planted in Cuba are obtained or recommended by INIVIT. “The other 30 percent comes from campesino tradition. There are local varieties that adapt very well to certain soils and climates,” he said. In 2012, everything seemed to be going well for the bean crop of Rubén Torres, whose land is near Santa Clara, the capital of Villa Clara. But because of the higher than normal temperatures, the harvest was smaller than expected. On the other hand, “rice needs high temperatures when it’s flowering time,” Torres told Tierramérica. Now he is growing rice, one of the staples of the Cuban diet, and says his productivity – eight tonnes per hectare – is good. Rodrigo Morales lives in the province of Mayabeque, next to Havana province. He and other campesinos who farm nearby have noted that the longer and hotter summers affect their garlic, onion and bean crops, as well as fruit like the guayaba. 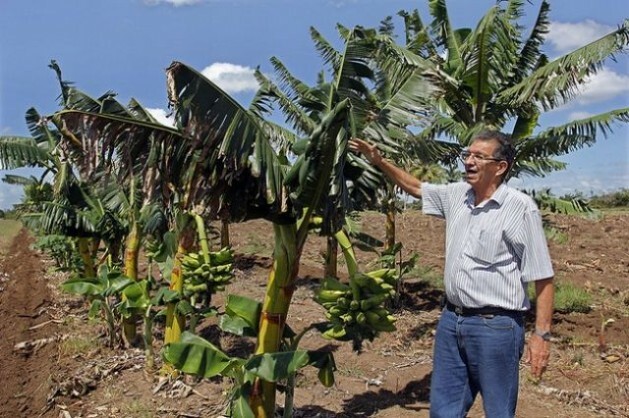 Under pressure from these climate phenomena, Cuban agriculture must increase productivity to cut down on food imports, which cost two billion dollars this year, the vice president of the Council of Minister, Marino Murillo, reported earlier this month. He described as “disturbing” the fact that agriculture accounts for just three percent of GDP, with a workforce of 960,000 workers – including 300,000 who are not directly involved in production – in a country of 11.2 million. Without taking into account sugar cane, agricultural production fell 7.8 percent in the first three months of this year with respect to the first quarter of 2012, according to the latest figures from the national statistics office.